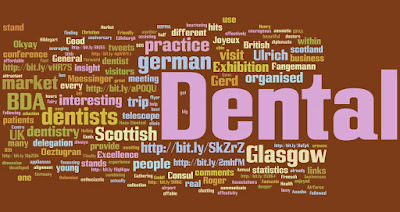 Below is a collection of the tweets I made as a result of meeting people at the British Dental Association's Annual Exhibition in Glasgow and comments from the fantastic Dental Technicians in the fact finding delegation from North Rhine-Westphalia I was supporting. The number of hits on links within the Tweets ranged from 9 to 32, with most averaging at about 19 - 20 hits. The statistics revealed that the responses peaked within 24 hours and that half of the visitors were from the US, followed by the UK. I use www.bit.ly to shorten links and they provide the simple statistics as part of the service. Ulrich thoroughly recommends the dentists version of Bohemian Rhapsody at http://bit.ly/Q14Fi !! Did you know you can shorten your urls with BCVC and earn money for every click on your shortened urls.